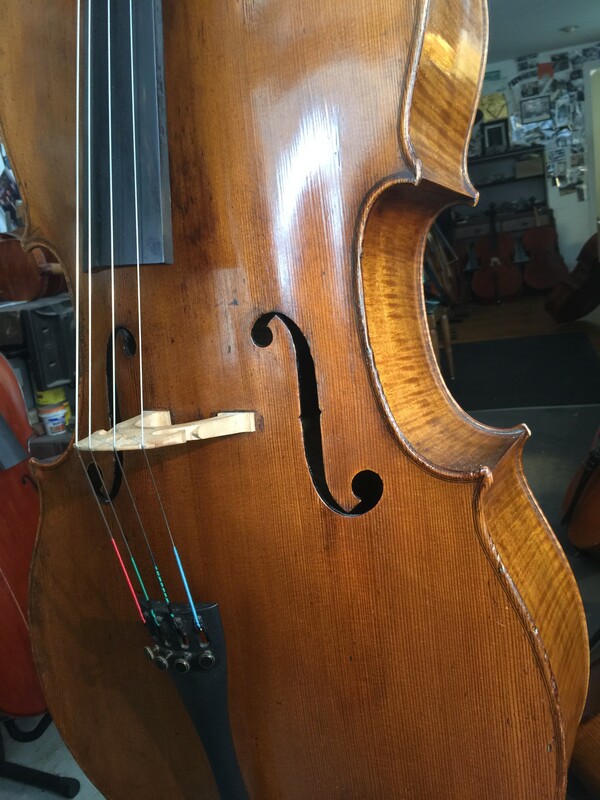 Carl Becker is probably the finest American maker of the 20th Century …and his Cellos are among the best of his creations. This fine example dates from the 1930’s and has all the defining characteristics …especially his luminous,transparent reddish-orange varnish. 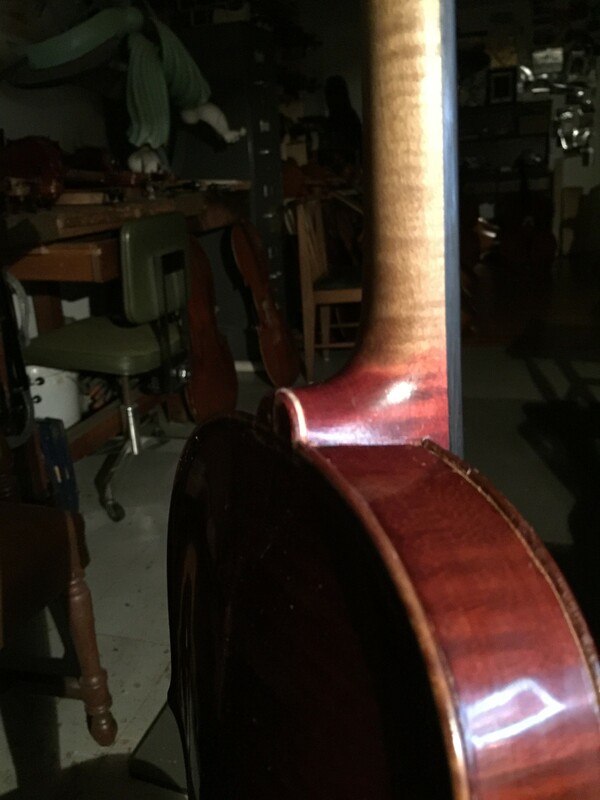 This cello is owned and played by a wonderful player/teacher in the area who comes from Chicago ….the land of generations of Beckers. 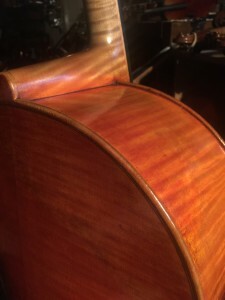 The dramatic wear pattern is a testimony to both the close-up physicality of playing the Cello colliding with the delicacy of Becker’s varnish. 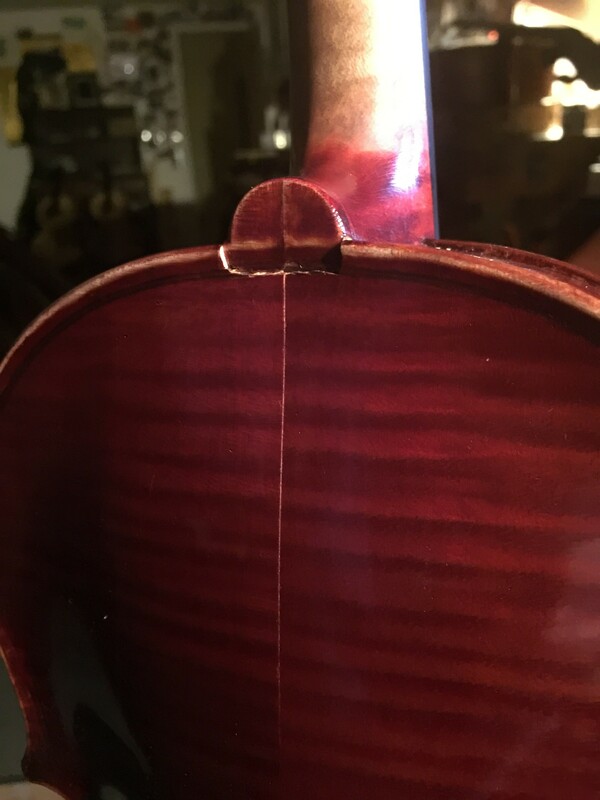 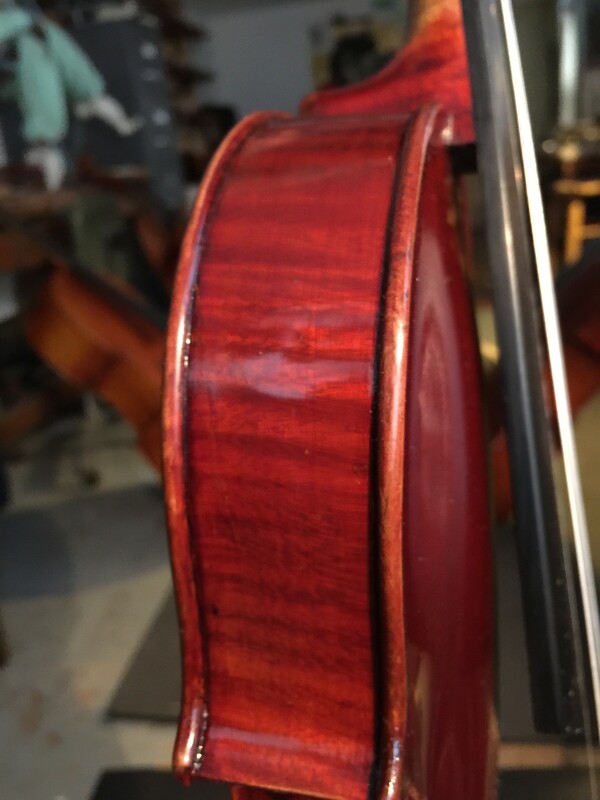 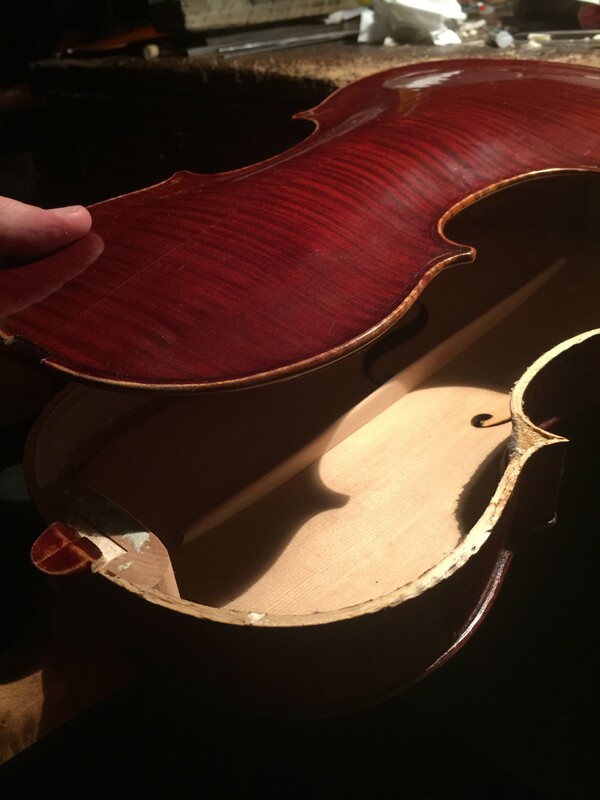 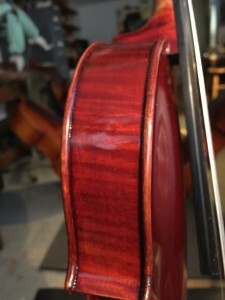 It was pleasure to be entrusted with this delicate repair (which consisted of restoration over the entire instrument)… the building up of layers of color and vanish .. doing your best to give the Cello what it deserves. 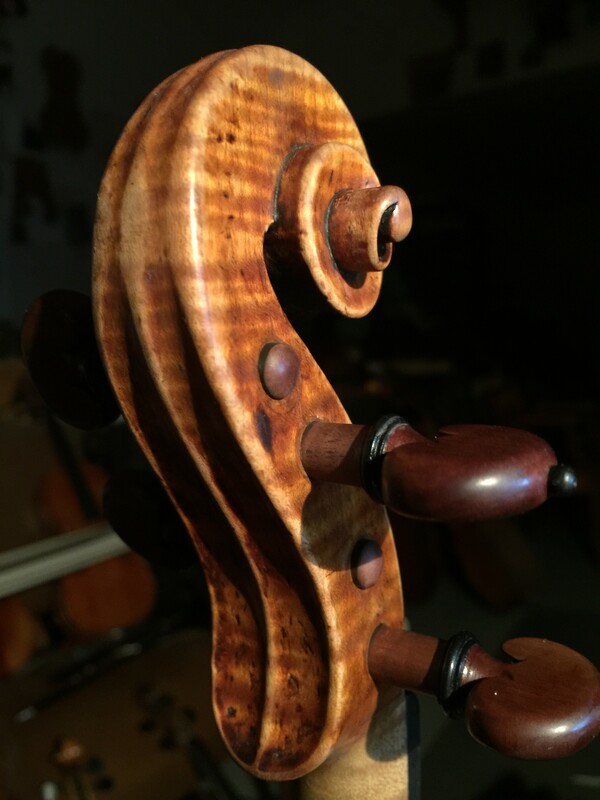 Its a reminder that old instruments are now a collaborative effort; stretching from the maker, through all the hands in the past, to the hands of the present. 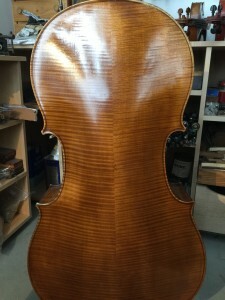 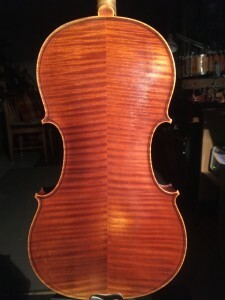 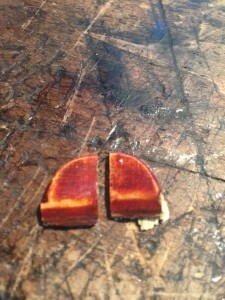 This stunning back is from a violin by Sebastian Vuilluame…. 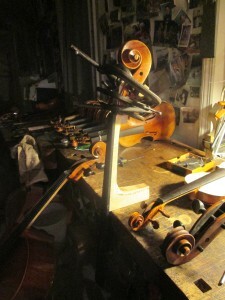 and shows the hand of his protoge and successor Nestor Audinot. 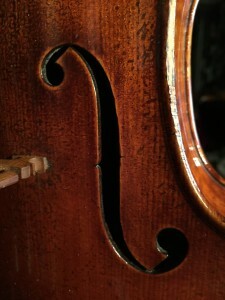 Sebastian is the nephew of the great J.B. Vuilluame… and , interestingly, married the daughter of Dominique Peccatte. 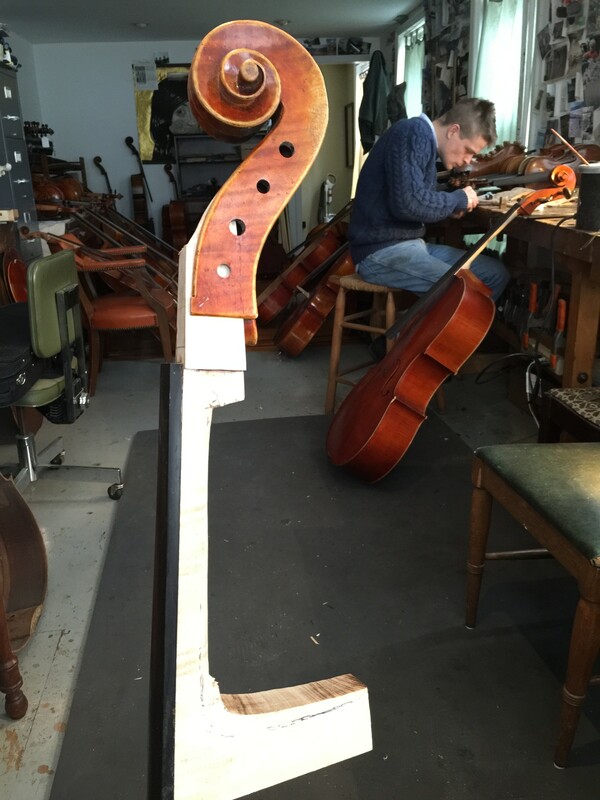 This is very much in the tradition of French makers and dealers….where the illustrious head of the shop often doesn’t actually make the instrument. 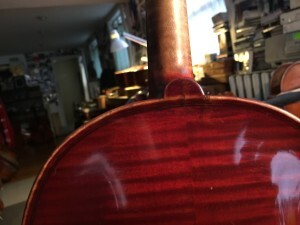 Typically there are number of craftsmen involved with the finest instruments made by the premier artisans…with sometimes ( as in JB Vuilluame’s case) the master varnishing the finer instruments. Nestor Audinot was the premier worker for S Vuilluame, and even eventually took over the shop upon the death of S. Vuilluame. 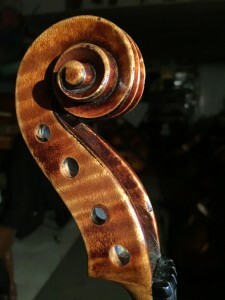 I am proud to offer this crisp, stylish violin for sale. 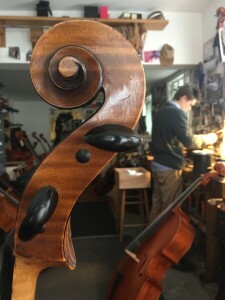 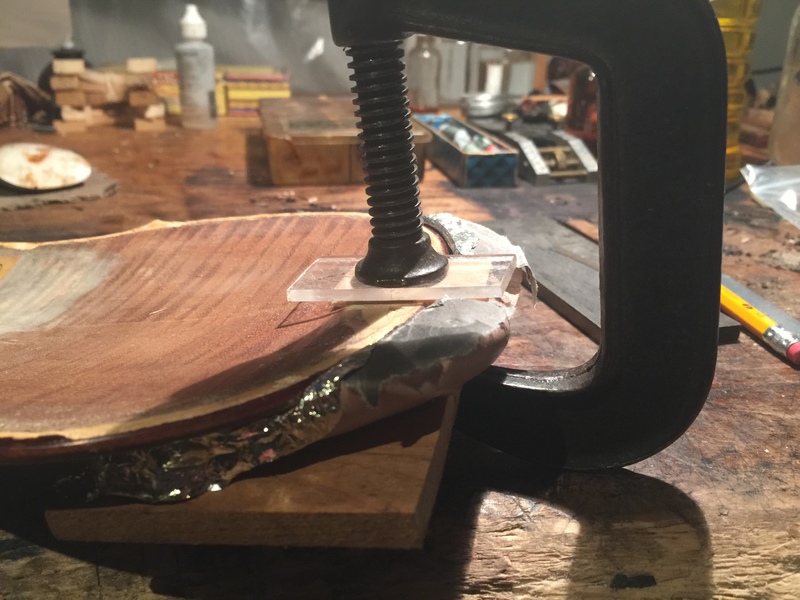 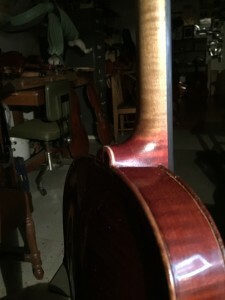 Fun project converting an older German cello that belongs to Derek Barnes of the Philadelphia Orchestra into a 5 string cello …. 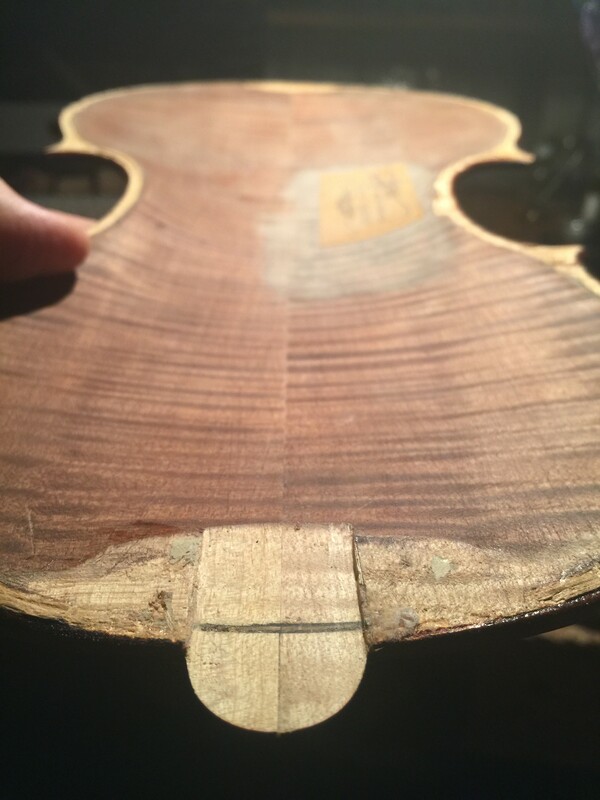 with a high E. I removed the old fingerboard and replaced it with a wider one that flared subtly outward from the neck to allow as much playing surface to space the strings…. 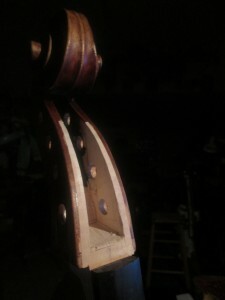 along with a new top nut. 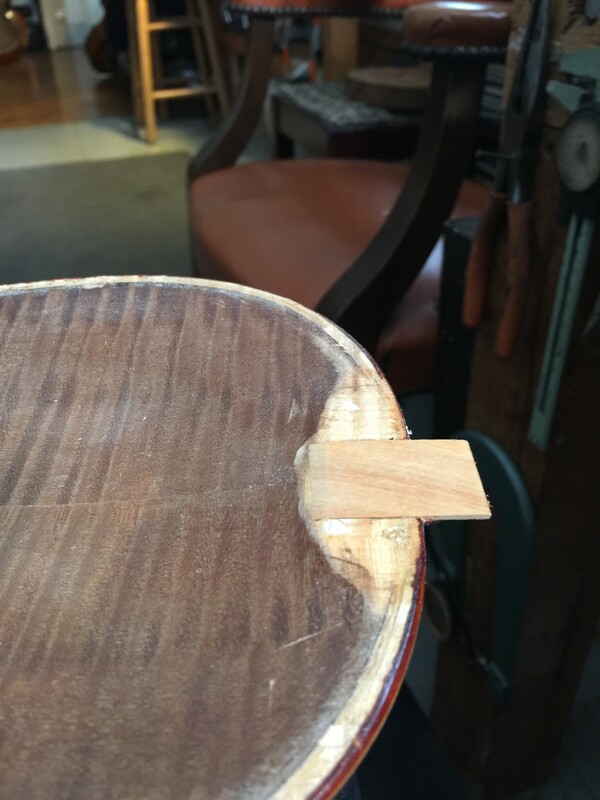 Here is a shot of the Baroque bridge being roughed out… and me tentatively working out the overall and individual spacing for playability. Derek had a clever idea of drilling an extra hole in the A peg to accept the E string. 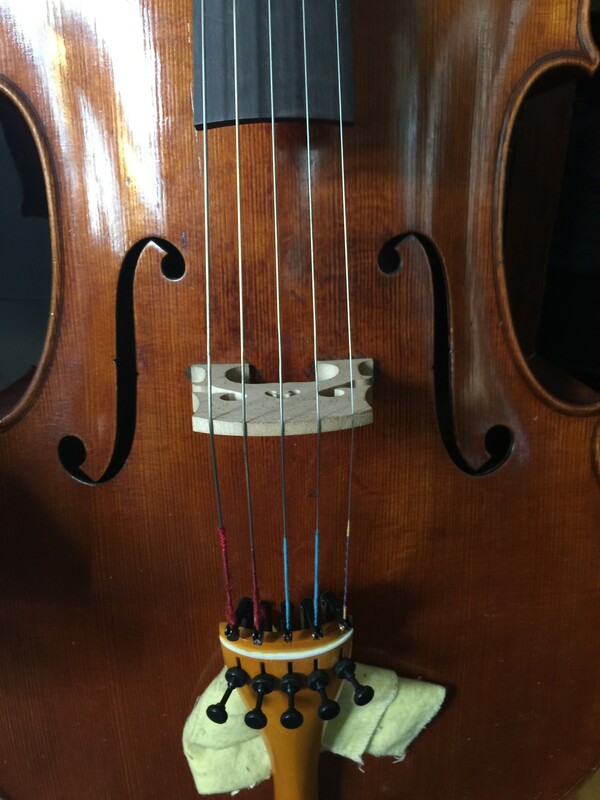 By adjusting the amount of tail of the E string pulling through the peg you could tune both strings quite close to pitch and then use fine tuners from there…. much easier than bushing all 4 peg holes and reaming out 5 new ones! Fascinating to hear the whole other world a cello can produce when the sound leaves the A string and soars into the unknown reaches of the E string! 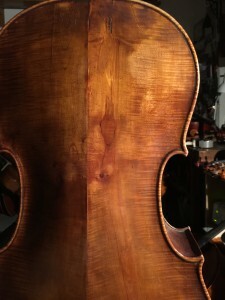 Always enjoyable to meet with David …we’ve collaborated on some restoration projects over the years…. 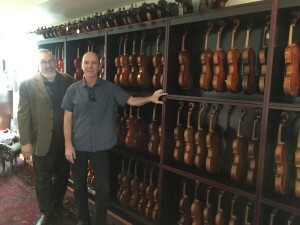 and here we are standing with his impressive collection of American violins. 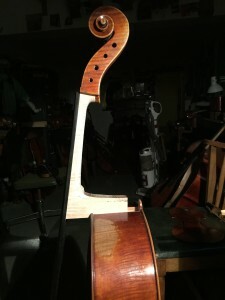 His collection is going to be part of the Library of Congress and he has asked me to set up/adjust and make them all they can be as they enter this prestigious institution. It will be fascinating to get to know all these instruments ….and I’ve found that the best way to do this is through the time spent working on them…. 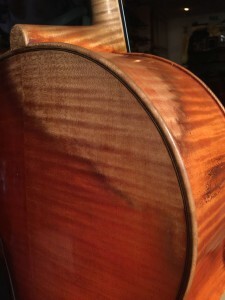 and there should be plenty of that. This dramatic cello is a mid 19th century Italian instrument by Andrea Postachinni… and is part of the gorgeous sound that is the Philadelphia Orchestra.It is always inspiring to work on such a bold, artistic instrument. 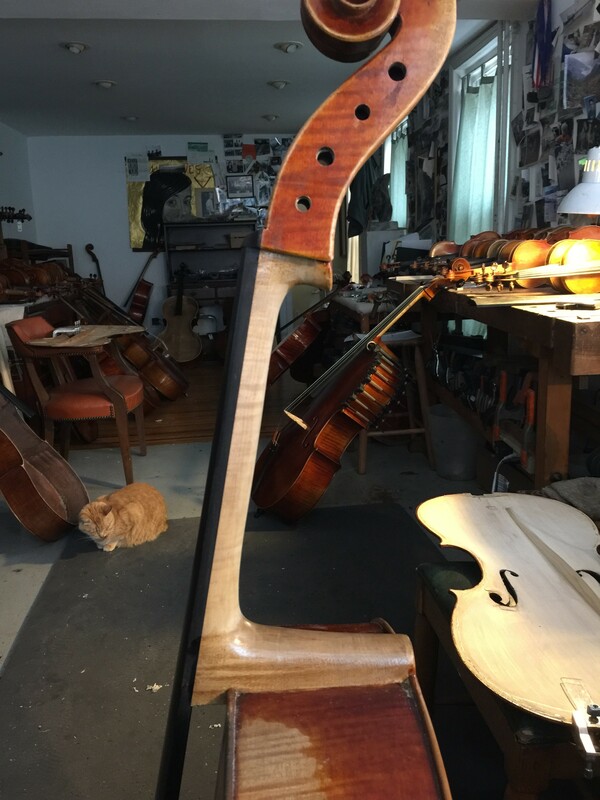 It does make me smile though, thinking of what reaction I might get if I made an instrument with wood such as this and submitted it to a competition….. 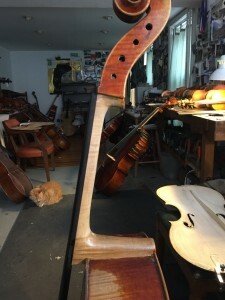 I have a distinct feeling that I would be ridiculed…. 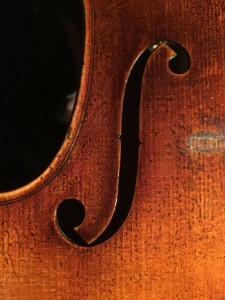 which is a shame in that we are missing some of the essence of the great string instruments of Italy. 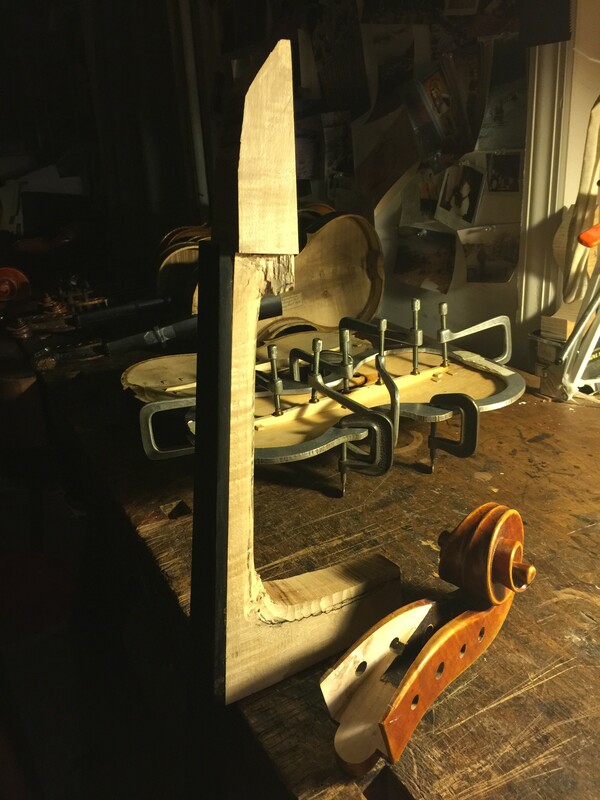 The sense of daring … the personality … the sense of making a magical,musical instrument….not with sterile competence …but as if its a matter of life and death ….thats what I think is the most moving aspect of Italian instrument making…. 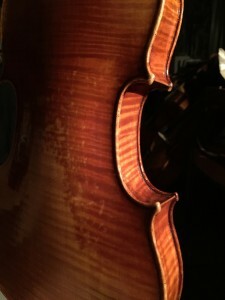 Another interesting quirk of this instrument and its maker is the center seam area… you can see from the shadow that the center seam comes up to a rather hard ridge line , rather than the usual rounded arching ( I’ve also seen this on his violins)…I’m not sure if he does this for acoustical reasons ( like added mass changing the tone/sound) or maybe he does it to add more gluing surface to the center seam ( for strength/durability)….or maybe he was just trained this way….another instance of individual personality that fascinates the discriminating admirer….